Mesotherapy was discovered by the late Dr. Michael Pistor more than 60 years ago in France. According to Dr. Pistor, by definition, Mesotherapy is what he termed “surgical medicine” because it is the practice of placing medications by injection directly into the skin at the site of pathology or condition being treated. Fusion Meso is internationally renowned in the field of cosmetics, mesotherapy products, medical devices and mesotherapy systems. The benefits of Mesotherapy are numerous. 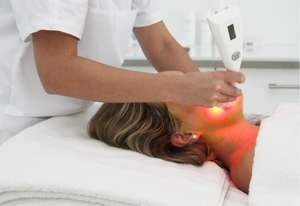 There are many applications for Mesotherapy i.e. treating pain, sports injuries, rheumatology, general medicine and aesthetic medicine. In 2005, a new technique known as virtual (needle-free) Mesotherapy became available on the international market. This was a significant advancement for both Mesotherapists and patients. The Fusion Mesotherapy products that are used within the treatments are of the highest quality and contain the most advanced ingredients and unique formulas. When Fusion Mesotherapy is combined with collagen stimulation the results supersede or electronic needling results Why? Because having a true and in-depth understanding of each client’s skin,flexibility to treat multiple conditions at the same time, the knowledge of how to use most advanced products, coupled with a superior device, provides us with the ability to reach and meet expectations overtime through our advanced treatment plans. FUSION EXPERT A needle-free device is used to emit a pulsed electromagnetic wave that creates transitional pores at cellular level, this phenomena is called “electroporation”. By using in synergy electroporation and conventional Mesotherapy, it´s possible to improve the dissemination of the product in the tissue, the cellular transfer of the active ingredient and to reduce the side effects. Fusion MESO XPERT is an electroporation and LED stimulation meso device. It enhances the penetration of meso cocktails. The specific pulsed current produces a cellular electroporation that open cellular pores. It induces the opening of the protein channels on the cellular membranes; this phenomenon allows substances to reach the heart of the cells. At the same time the light emitted by the LED will activate certain biological functions in the skin and the cells. Dermapen Microneedle, Collagen stimulation or collagen induction Therapy as it is also known has long been a popular and effective treatment. Originally performed by a dermal roller, in recent years advancements have progressed from a hand held device to an electronic device that offers not only superior results but has also resulted in an increase in comfort for the individual receiving the treatment. It is also important to remember that not all practitioners are performing a fractionaL Fusion Mesotherapy treatment. Fusion fractional Mesotherapy is a specialist treatment undertaken by practitioners that have specialist knowledge and training in Mesotherapy, providing the skills and ability to treat each client individual condition, resulting in the best possible outcome. The Fusion Mesotherapy products that are used within the treatments are of the highest quality and contain the most advanced ingredients and unique formulas. When Fusion Mesotherapy is combined with collagen stimulation the results supersede or electronic needling results Why? Because having a true and in-depth understanding of each client’s skin,flexibility to treat multiple conditions at the same time, the knowledge of how to use most advanced products, coupled with a superior device, provides us with the ability to reach and meet expectations overtime through our advanced treatment plans..